Born and raised in British Columbia, Canada, Robin has spent the bulk of her pro career exploring the mountains of Canada, Alaska, and Patagonia. Each winter she splits her time filming for projects like Full Moon and Depth Perception, and guiding at Baldface Lodge. 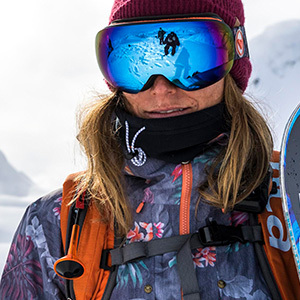 Robin has chased the endless winter many years and has over 10 years of coaching, splitboarding, and exploring experience in the mountains of Argentina. She also has a passion for getting more women out into the backcountry and has participated in many women's programs including the Safe As clinics. When she isn't chasing storms and scoring big lines, she posts up at her West Coast hideaway to enjoy the beach and surf life. It's not the MOST epic, but definitely the most memorable. I was on one of my last days in Patagonia and I had two days to kill with good weather, so I went for a split mission to Refugio Frey. I couldn't find anyone to go with me so I decided to go it alone, which I now know was a totally stupid. I split to some lines and lapped solo all day, but decided to exit early as I got my fill and the snow was going bad. The exit was not what I thought and I took the wrong route and ended up in some sticky rock climbing situations hiking with my split board on my shoulders. I made it out just before it was too late nearly missing some slide for life scenarios. In hindsight, this was actually the best thing I could have done as I learned important lessons about ego, backcountry travel, and what NOT to do. I did manage to ride a few life changing lines that day...! Too many individuals to list them all here. I have always sought after and surrounded myself with knowledgeable people who push me to progress and learn. Two crews that shaped who I am are the Full Moon crew and the SASS crew. Women who break boundaries and forge their own way despite the stereotypes. We still have so much work to do when it comes to changing the way people think about gender. Being around women who are not afraid to do what they believe in to inspire others is what I am all about! It is by far the best splitboard gear. I think it is because Spark has kept it simple concentrating on durability and functionality. When traveling in the mountains, it is so important to be able to trust your gear and I trust Spark.